News organizations (along with businesses of all kinds) have been able to create official Google+ pages for a couple months now so I thought I’d check in and see how their pages are doing. I’m going to forgo looking at which media outlets have attracted the largest following since that data becomes quickly outdated. Instead I’ll focus on some basic signals of user activity and engagement: the number of 1+’s, shares and comments on each page. To pull the activity and engagement figures I used All my +, an interesting tool created by Gerwin Sturm. 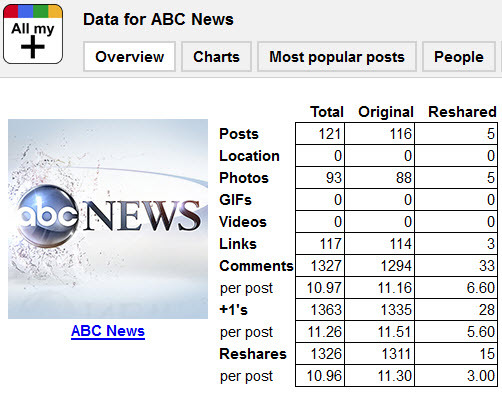 I collected the +1, share and comment figures for a selection of 45 news organizations. The post volume varies greatly by page so I focused on the per post averages to allow for better comparison. The list of organizations is not meant to be comprehensive; I chose a cross-section of print, broadcast and Web-only outlets. Most are from the US but there are a handful of international sites too. I omitted location-focused outlets such as local TV stations. Normally in posts like Which News Sites Get the Most Social Media Engagement? I stick to mainstream news sites, but this time I expanded the scope a little to include TechCrunch, Mashable, ReadWriteWeb, The Next Web and CNET. The New York Times leads the group by a considerable margin. Their total output on Google+ is considerably less than some of the more active pages but what they do post gets a lot of interaction. Mashable and The Next Web at #2 and #3 is not surprising based on the nature of their audience. I expected TechCrunch to be right up there too, but they did make the top ten. Fox News tends to get a high volume of comments per Facebook update, so I was curious if the same would hold true on Google+. It does to some extent, as 22.70 puts them in the top 5 for comments per post. But their fan base is not nearly as active on Google+ as it is on Facebook. One organization that is missing is CNN. Surprisingly as of today they do not appear to have an official page. The top Google+ search result for “CNN” is a people result that no longer exists. So instead I included CNN iReport (although it is not a great representative since there are only a couple posts on the page). Have you noticed any news organizations doing particularly noteworthy things with their Google+ pages? Based on feedback from Cory Bergman of Breaking News (see comments below) I went back and pulled the total +1, share and comment figures for each site. Originally I chose not to use the total figures because it felt like more of an arms race comparison. Sites with more posts will typically have more user interactions, so that didn’t seem like a useful insight. I was more interested in the level of activity and engagement the pages are getting on average. In addition the total figures will quickly go out of date. However I agree that a comparison based on averages can also be skewed by pages that have made very few posts. It’s sort of like baseball statistics; you need a minimum number of at bats in order for the figures to be meaningful. In this comparison Breaking News moves up two places to #3 overall. The Next Web, Mashable and Breaking News dominate the group in terms of total user actions, which is impressive. The New York Times drops down to #11, but based on the welcome message in their first post they are apparently taking a more conservative approach in terms of total output. Attracting a decent number of user actions with a fairly limited number of posts is impressive too. Hey Adam, Cory with Breaking News here, great post. But I would argue that defining engagement solely as activity per post is missing the big picture. +Breaking News has a much higher number of comments, +1s and shares than +New York Times, for example, because we post frequently. (In fact, we’re the only news organization that publishes around-the-clock, 7 days a week). It would be great to combine the “per post” metric with an overall metric to get a better perspective of engagement. Thanks for your feedback Cory. Breaking News is a great example of Google+ efforts done well. I see what you’re saying regarding the total figures. I opted not to use those because I felt it created more of an arms race comparison. Having more total user actions just because a page has more updates didn’t seem that insightful. I thought it was more interesting to look at the averages per post, to even things out a bit and make a more fair comparison. But you’re right that a page with very few updates will skew those figures too. I’ll try to swing back and capture the total figures too. So what’s your conclusion? Does it seem worthwhile for these organizations to be using Google+? Would it be better if they focused their attentions elsewhere, like Facebook? What about the same for Facebook? Interesting data. Google claims that Google+ growth will continue with impressive numbers in 2012. It will be interesting to see if that holds true and how that effects brand page engagement. Thanks Nick. It will be interesting to see how things continue to evolve this year. And now with “Search Plus Your World” it’s even more important for brands to connect with their audiences via Google+. Jennifer – I do think it is worthwhile for news organizations to continue to experiment it. For audience engagement and content promotion Facebook and Twitter continue to be much stronger plays and deserve more attention. But having a Google+ presence makes sense too, especially because Google is doing what it can to get it better integrated into their overall search experience. Arif – I did something basic on Facebook pages quite a while ago (Which News Sites Have the Most Valuable Facebook Pages?). Maybe I’ll look for new ways to do a comparative analysis. I am one of those who think that brands corrupt the real social environment. For example, social platform can remain social between two person or group, but when you mix in the brand, it no longer serves the purpose of being social. From a functional stand point, I can be social with another person or a group of people, but I cannot be social with a brand (brand is not a person). So I have one or few of the choices to pick from: (a) I can pretend that brand is a person and I should interact, (b) I ignore it, or (c) I use that platform strictly for reading or taking-in what brand wants me to take. You see, right here, the social is a slippery-slope for platforms mixing the brands. All these news platforms are one-way delivering news, their purpose is to serve the news. They are not in a business to take anything from me socially, for that, they have had Editorials and Write a Letter sections for long. In present day sense, they are only advertising their content through multiple mediums. It is obvious that Twitter has an upper hand here when it comes to brands utilizing a platform for maximum advantage. I was idle on Google+ until I saw your post and decided to reuse G+ only for the sake of following these brands/news, in a one-way fashion. I have Google Reader and Twitter doing the same exact thing very well, and I can already see that G+ is not really an effective platform for one-way interaction or reading. Thanks for your input Arif; you make some valid points. I do think that there is middle ground though, for users that want one. Brands aren’t people, but they do have people working for them. So social does give users the opportunity to interact with real people who work for the NYT, Breaking News, Newsweek, etc. Specific to Google+ this could via discussion in the comments, video hangouts, etc. There’s not always a lot of value in that, but in some situations it can be pretty interesting. Especially when news organizations let users behind the curtain a little on what they’re working on and the editorial process, or when they solicit input for help in creating new content or special features. From the user perspective the good thing is this is all by choice. If I don’t want brands in my circles I don’t have to add them. And even if I do, I don’t have to interact with them unless I want to (and I can even filter out their content if I want). And from the brand perspective this creates a need for them to make their pages useful and engaging, so users want to follow and interact with them. Which in turn creates a better user experience on the pages.